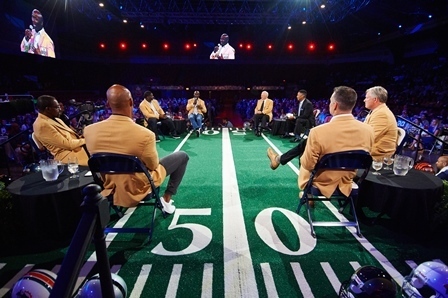 Guests will enjoy lunch followed by a center stage roundtable presentation featuring the Class of 2019 Enshrinees.The event will be emceed by a sportscaster of national acclaim in an unscripted, up-close-and-personal format where the Enshrinees share stories and memories of their careers. Seating in various satellite rooms, all offering the same quality meals and amenities. After lunch, guests come into the main arena elevated perimeter seats to enjoy a great view of all the festivities. Tickets will be mailed early July 2019.